Indian recipes call for using Maida or All-purpose flour in making samosa. Disregarding for a second the difference between the two (as discussed in here - Difference between Maida and All purpose flour), is it possible to use "regular" white refined flour instead of all-purpose one? To clarify - I live in a country (Israel) where it's not possible to get Maida. Until now I have bought what is called all-purpose flour for samosas, but actually what is sold here as "white flour" seems to have similar nutritional content (All purpose flour has 10.4% protein, while white flour has 10.5% protein, similar calories and fat values). The reason I would like to use white flour is because it is 30% of the price of all-purpose flour. There has been quite a bit of confusion here concerning maida (which can be labeled all-purpose, especially in India). The top answer on the question that you linked to was actually incorrect. It has been fixed. Maida is actually a very low protein flour, much like what would be called cake flour in the US. I suspect and would appreciate if you can confirm that your use of the term "all-purpose flour" stems from the Indian use of the term, not that your recipes call for what Americans would call "all-purpose flour". "It's confusing. 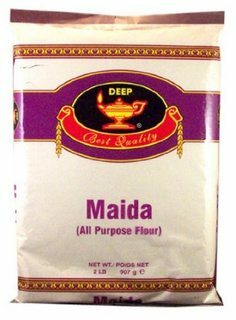 In India (and therefore also on its exports) maida is sometimes labeled "all-purpose", but it is more like what Americans call cake flour. Israel has its all-purpose, which is less processed than the all-purpose in the US. What is called cake flour in Isreal would be called self-rising flour in the US. What Isreal has that is the closest to what Americans call all-purpose is called white flour." You should be able to use a high protein white flour as a substitute without too much issue. White bread flour would probably be best. Do you plan to bake or fry your samosas? If you plan to fry you could use wonton wrappers instead, it's what all the restaurants do. Saves loads of time, and they get very crunchy. Not the answer you're looking for? Browse other questions tagged substitutions flour indian-cuisine or ask your own question. Any other flour which can be used to replace Maida flour for chewy cakes?